Public speaking skills once took years to acquire. Now you can master them in just half a day. 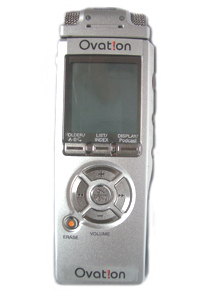 Whether you're an actor or a speaker, Ovation Earprompter Training teaches you how to deliver your material, word-for-word, every time, without notes or memorizing and with complete confidence. The Ear prompter combines advanced miniaturized electronics with the latest communication techniques to make you the consummate professional speaker. For actors, it is a faster, easier, more natural teleprompter alternative. And now you can learn this invaluable technology in either a personalized coaching session or by using our award winning interactive DVD. Banned By Toastmasters Because "It's Too Easy"
Visit www.EarPrompter.com for class schedules, instructional videos, and further information.